Dr Karel Machaček, England 1942. On the morning of February 25th, 1948 I set off for work at the usual time. As my tram was passing through Wenceslas Square, I noticed a crowd of people in front of the Trade Union H.Q. and the Communist Party building. Some of them carried Red Flags. It was nothing unusual and I did not take much notice of it. By the time I got into the office, I had forgotten all about it. During the morning, disquieting news kept filtering into the office, which by lunchtime amounted to an alarming catastrophe. There had been a revolution. The Communist Party, with the help of the Communist members of the government, had taken power over the whole state administration. President Dr Beneš was a prisoner in Prague castle and all non-Communist ministers had been arrested and denied access to all media – newspapers and radio. All political parties in opposition to the Communists had been dissolved and their premises occupied. All newspapers carried identical stories which were the same as the news bulletins on the radio and all hailed a great Communist victory. The information coming to us claimed that the country was getting rid of subversive and treacherous elements who had been trying to establish a Western capitalist exploitation of Czechoslovakia. The Munich agreement of 1938 figured prominently in the arguments as an example of Western treachery, thus playing on the sentiments of the population. The role of the Western powers in the war was denigrated; they were accused of all sorts of mischief, including collusion with Germany, and were showered with derogatory remarks. All those who supported them deserved nothing better than to hang from the lamp posts of Prague streets. Our only faithful friend and ally was the Soviet Union who, alone and with enormous sacrifices, had liberated Europe and Czechoslovakia from the Nazi terror and was the only guarantee that any conquest of the Czechoslovak territory by the Western imperialists would not be repeated. We had to look to the Soviet Union for friendship and protection and prove to them that we deserved it. The centre of Prague was filled with crowds of people brought in from factories around the Prague district with their militia occupying all the strategic positions. 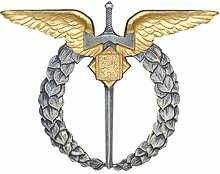 They were ably assisted by the Czech police under the command of officers appointed by the Communist Minister of Interior. The Army was kept in the barracks with directions that it was not its function to interfere in the internal politics of the country. The order had been issued by the Communist Minister of National Defence. The country was sealed off from the rest of the world and all travel permits cancelled. The border guards were strengthened, given guard dogs and told to shoot without hesitation at anybody without authority near the border. Anybody trying to escape from the country and caught would be severely dealt with. It dawned on me then why so many prominent Russian politicians and high-ranking officers had recently been in Prague and why the Russian Ambassador had been almost living at the Communist Party H.Q. I felt sick but tried not to betray my feelings, not knowing who was watching me. On my way home in the afternoon, the trams ran only a limited service because they could not get through the centre of the town congested with revolutionary demonstrators. I had to walk most of the way. At some points, speakers’ rostrums had been constructed on which one speaker followed another to be cheered by the crowds composed mostly of organized factory workers, students, opportunists and a collection of various dropouts. They were being promised a paradise on earth which would be created by the Communist regime in Czechoslovakia. The promises described a utopia of selfless and equal society where everybody would be taken care of from the cradle to the grave. Hand in hand with the promises, went declarations of eternal love of the Soviet Union and vicious attacks on Britain and other Western countries. I was horrified and disgusted. I wondered how many of these people knew what they were demonstrating for. That they were, in fact, demanding creation of a society of depraved and impoverished individuals totally dependent on a system which would take away from the individual all his freedom and choice. I wondered whether anybody realized that with the promises of jobs for everybody went very low wages, which made the promises meaningless, because a family could not survive on one income. The only beneficiary was the system itself because it could exercise much greater control over the people through their work, their position at work, promotion, pensions and all the rest of it. It would be the system that decided the size of your living accommodation even if you built it with your own hands, and the system that decided the rent you paid for it. It would be the system that decided your children’s education from the nursery to university and which would control the results of their examinations. The system would allow for one political opinion only through the media and would isolate people from comparisons with the non-Communist world. The system would re-write history, distort historical facts and suppress anything that did not fit its purpose. The system would elect to ignore great national achievements of the past or belittle their significance. The system would prevent access to information about other countries by prohibition of import of newspapers and other literature including the Bible. The system would jam foreign broadcasts and prevent its citizens from travelling. The system would call Western democracies fascist and make the word ‘capitalist’ the dirtiest in the vocabulary. I wondered how many people in that crowd realized that this was the last time they would be able to come into the streets and demonstrate disapproval of the government. I was sure that the next time they came into the street to shout slogans, it would be by direction of a Commissar who would tell them what to shout. I wondered whether they realized that in the future they would have to account for every absence from May Day processions or classes of political indoctrination. Would they be able to disobey? Would they be able to afford to disobey? Each one of them would aspire to improve his material position sometimes perhaps by moving into a better flat or a better job or promotion at work. Each one of them would want his children educated and would seek their admission to a grammar school or university. Whether or not any of these aspirations materialized would, in the future, depend on one single thing: blind obedience of the system. These thoughts went through my mind as I was pushing my way through the demonstrating crowd. The whole basis of my existence, all I believed in and my way of life were shattered. I tried to analyse what I had in common with these people around me – my birth, my background and the language and I asked myself: Was it enough to compel me to identify with what was, to me, an alien element? Would I have to accept for the rest of my life this false pretence and malicious distortion of the truth as I knew it? How could I betray all I believed in and for which I had gone to war? My thoughts flew a thousand miles away from this crowd to England, which loomed like a glorious oasis from the middle of this wilderness. Before I got home, I had convinced myself that we could not remain living our lives in this environment, not just for my sake but for Betty’s and our children’s sakes even more so. We had a long conversation that evening. Betty sensed that something had been happening in the town but did not know the extent of it. I explained to her what had happened and what implications on our lives it was likely to have. In conclusion, I told her that we must try to get back to England, which I felt was our true home. Betty was delighted – for some time she had been homesick for England. The practicalities of our intentions were far from clear. We decided that we would wait for an opportune time and, in the meantime, lead our normal life as if nothing had happened. We also decided that we must keep our intentions to ourselves and confide only in people whom we could completely trust. At work I behaved as if nothing important had happened. I never discussed politics there and got on well with everybody. It was assumed that politics did not interest me. Many officers felt the effect very soon. There were arrests and suspensions, mainly of the officers who had served with the R.A.F. 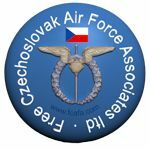 and Czech Army in England. I was not affected. Some of the first suspended officers had British-born wives who were active in an Association of British Born Wives in Prague. Fortunately, Betty never went. There was a suspicion that the Communists had their spies there. Very soon we were able to assess the attitudes of our friends. Most of those with whom we had associated did not make any secret to us that life in Czechoslovakia was finished for them. Only a few who decided to remain completely non-political and to accept what happened because of our family circumstances decided to stay. There were also a few who were prepared to bend their attitudes and join the Communist Party. The population at large who had spent the war under Nazi rule found it easier to accept the new order. Although people privately disagreed with the revolution, there was nobody who could effectively oppose it. Everybody had been caught by surprise and, with the opposition gagged, the country had no alternative. I saw Přemek and Anka whose father, Professor Stránský, was under house arrest. Přemek was working as an assistant to the Professor of Medicine of Prague University in one of the hospitals. His position did not seem in immediate jeopardy. They had a young son, only a few months old and any idea of escape from the country was not very realistic for them. Moreover, Professor Stránský maintained that his place was with the people who had elected him to his political position. My reaction to that was that he would not be much use to them in prison. We also visited Jiří and Edith in Brno. Edith was alarmed with the developments and anxious about their future. They had a second son called after Jiří – George. We arranged with them to keep in touch and keep them informed about us. I had long discussions with my parents who hated the idea of losing us but agreed that there was not much future for us under Communism. In ordinary everyday life there were at first no noticeable changes. Shops, transport, restaurants and life in general functioned normally. Everyone grumbled as usual, mainly about politics, but people began to look round at who was listening. People in prominent positions in public life, business and industry were the first targets. Some were interrogated by the political police about their political opinion, some were dismissed and replaced by people from the ranks of the Communist Party, irrespective of their ability or qualifications. In the Army, the purge continued. People began to disappear and it was not clear whether they had been arrested or had managed to get across the border. It became known that some people had been caught in the attempt to escape from the country and were awaiting trials. I tried to scrutinize our chances and how to get Betty, Jim and myself out of the country. Living amongst the pilots, the simplest way seemed to me to steal an aeroplane. But my pilot-friends were not very keen to take that risk. It involved too many people and the chances of success were very slim. I knew, from personal experience the difficulties of crossing the border on foot. Unfortunately, so many stories of war-time escapes had been told and the guards knew where to look. It made it so much more difficult. The British Consul in Prague made very strong representations to the new Czech government about the restrictions on travel of British-born wives of Czech nationals. For some time he could not get any answer, because, by Czech law, they were Czech and that was the end of the story. But the pressure continued and eventually the Czech authorities relented and allowed British-born wives to leave the country. The reason was given as humanitarian, but I thought they just wanted to get rid of them. A great burden fell from my mind and from many others. I was confident that I could find my own way out of the country once Betty and Jim were safe. Being anxious that nothing should go wrong, we did not want to betray our delight and simply pretended that Betty wanted to use the opportunity to visit her mother and also that she wanted to be confined at her mother’s home in Sheffield. When the exit permit was granted, an application was made to another office for export of some household goods as Betty’s visit was planned for several months. The people who dealt with it were very lenient about the quantity and content and we put in as much as we dared. People from an international haulage firm came to pack it in crates and took it away after a friendly customs officer – who happened to be the husband of one of our ex-nurses from Hammersmith Hospital – stamped it as correct. We even managed to put in our radio and Jim’s tricycle but I was very careful not to put in anything of my own lest anybody wanted to check it and use it as a proof of my intentions. On the second floor of our block of flats lived The Times correspondent in Prague, Godfrey Lias. We became friends during the two years we were neighbours. Mrs Lias often called for a chat and cup of tea with Betty and we had been their guests on many occasions. They knew of our plan and offered to move anything we wanted to England together with their own effects in the summer when they would be returning to London. Our collection of cut glass which we had accumulated from presents, my English medical books and my clothes were all moved to their flat. The day came – on April 10th 1948 – when everything was done and Betty, with Jim, had a reservation on the plane to London. I took them to the airport and said goodbye to them. I watched them as they walked towards the steps of the aircraft on the airport’s apron, little Jim only two and a half trotting obediently by Betty’s side, clutching her hand. In my life I have lived through many heartbreaking partings, but this one was unbearable. I felt total responsibility. They were a part of me and I had no idea what obstacles I should have to overcome if ever I was to see them again. I waited for the plane to take off and watched until it disappeared from the horizon in the direction and safety of England – my beloved England. ‘I am sure you will find out, was his answer. He asked me to wait in his office while he went out. I wondered whether the Military Police would come to arrest me, but somehow I did not have that impression if I had judged him correctly. He came back after several minutes, clutching two pieces of paper in his hand which he handed to me with the words: ‘You are suspended from your post with immediate effect’. Then he shook my hand adding: ‘Good luck to you. You are a friend I may need one day’. But he did not need me and I never saw him again. It was a help to me to be suspended from duty until a decision was made about me, because I needed time to prepare my clandestine exit from the country. If I disappeared suddenly while I was working, my absence would be noticed immediately in the office. This way I could move about, go to my parents for a few days or to my uncle and nobody would know where I was. I knew that our Communist porter was keeping his eye on me. Shortly after Betty’s departure, Jiří brought Edith and their two boys to spend the night in our flat before departing to England. Jiří had a few ends to tie up in Brno before he could leave himself. I suggested to him that we went together but he declined because he had had a bad experience at the beginning of the war. Twice he had tried to cross the border with other people and had been caught, resulting in several months in prison. He had succeeded when he had gone on his own. It may have been that, with me being still on active, I was an additional risk, with me being still on active service. I was an additional risk. He had no foreign currency and I had ten new pound notes, which I shared with him until we got to England. Přemek and Anka persuaded Professor Stránský to leave the country if and when possible. Other guarded politicians managed to slip their guards but not all of them were successful. Those who were caught got twenty years in prison and similar sentences were passed on active service officers when they were apprehended. It was slightly better than the fate of our Foreign Secretary Jan Masaryk, well respected in England and very popular in Czechoslovakia. He was found dead under the window of his flat at Prague castle. Professor and Mrs Stránský needed special planning and I was asked to contact a certain American Intelligence Officer in Germany when I got there. The name and telephone number I memorized. I moved as many effects as I could from our flat to my parents in Brno and my father helped me. We did it in small amounts so as not to create suspicion. Occasionally I gave the porter a tip or brought him something from the country when I was away a few days. At the same time, I was making careful enquiries about contacts with people living in the towns and villages near the border who would be prepared to show me the way. Eventually, I found a lead through a former officer who lived in our block of flats and who also had an English wife. He was working in an office of a firm whose secretary came from a small town on the border with the American Zone of Germany. When carefully approached on the subject, she agreed to make a reliable enquiry. We had a meeting with her at my friend’s flat and she gave the impression of a fearless and patriotic person. She knew what was needed but we had to wait until she was able to visit her home town and arrange it. About a week later, we had a date of action. I went to Brno to take farewell – again – of my parents. I felt sorry for my poor mother, father and sister. I had caused them a lot of heartache in my life. 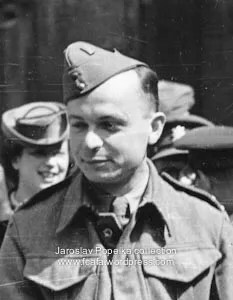 Shortly after this Communist putsch, Karel Machaček, with other former Czechoslovak RAF and Army colleagues, successfully managed to escape over the border into the American Zone of Germany. More details can be found in his autobiography here. This entry was posted in 311 Sqd, Into exile. Bookmark the permalink. Thank-you for this. It is fascinating and helpful. I am trying to get info. about my grandparents and uncle who were turned over to the Nazis by Czech fascists in Bruntal. I would be most grateful for information on that pre-war and early-WWII period. I have tried to contact the city authorities, but not being able to speak Czech or German, it is particularly difficult, and I am sure they are very busy. All the very best and thank-you.